The commemorative coin was issued by the Central Bank of Armenia. It is devoted to the 32-nd World Chess Olympiad in Yerevan. The chess game (Jatrak) was popular in Armenia since the ninth century. Armenia is a country with many well-known chess players, among which was Tigran Petrosyan, who became the ninth World Chess champion. The 32nd Chess Olimpics will be held in Yerevan, Armenia from 15 September to 2 October 1996 and to honour this now famous international tournament the Central Bank of the Republic of Armenia is issuing a splendid silver Proof 100 drams coin with the reverse design reflecting the country's high regard for the game and its continuous support of the Chess Olimpics. The first true Chess Olimpiad was played under the auspices of the Federation Internationale des Echecs (FIDE) in London in 1927, with sixteen nations taking part. Hungary, who had the enviable distinction of winning the prestigious title, were presented with the Hamilton- Russell Challenge Cup, donated by one of the great patrons of the game. Except for the duration of the Second World War, tournaments have since been held every two years with an ever-increasing number of grandmasters competing. The games were held in Buenos Aires in 1939 and recommenced in 1950 in Dubrovnik, Yugoslavia. Moscow was the venue for the 31st Olimpiad in 1994. The obverse features the Coat of Arms of the Republic of Armenia. 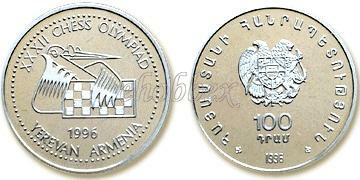 The reverse design of the special commemorative coin for 1996 depicts the Armenian logo of the 32nd Chess Olimpiad.